RIR presents more easy-to-prepare treats that can be made in India all-year long. The summer in India is almost over but we continue to benefit from fresh produce that we get in the market. 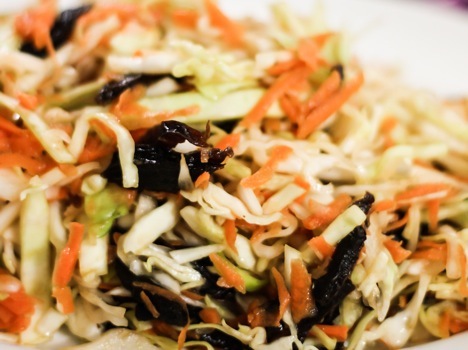 Today I want to introduce varieties of fresh salads that contain dry fruits. Dry fruits are a great addition to our meals: raisins, prunes (dry plums), dates, figs, apricots to name a few. In India the most common dry fruits used are raisins and dates. Prunes and apricots are relatively new products in the market. In Russia prunes, apricots and raisins are widely available. Usually they are imported from Central Asian countries like Uzbekistan. Surprisingly India, despite being geographically close to Central Asian countries, still imports prunes from America. 1. Dried fruits are healthier than their fresh or cooked counterparts. 2. All prunes are plums, but not all plums are prunes. 3. Prune plum varieties have very high sugar contents that enable them to be dried without fermenting while still containing the pits. 4. Dried grapes are called raisins because raisin is a French word, derived from the Latin word “racemes”, meaning a cluster of grapes. 5. Raisins are grapes with about 85 percent of their moisture removed, leaving the concentrated goodness and nutrients intact. 6. The date palm was one of the first cultivated trees. It was domesticated in Mesopotamia more than 5,000 years ago. Clean and peal the vegetables. Cut cabbage into very thin slices. Squeeze lemon and add sugar and seasoning to your taste. Suggestion: raw cabbage can be very hard to eat. To make it easier, you could add a pinch of salt and mix it with your hands, similar the way you mix dough for chapatis. Cabbage will give juice and will be much softer to eat. Wash raisins and soak in hot water for 5-10 minutes. Grate the apple in a similar way. Mix with raisins and sour cream. Suggestion: the easiest way to make sour cream is to mix set curd with fresh cream in equal proportion.